As an alternative to fitting spandrel panelling underneath a staircase, it is possible just to block off the underside of a staircase. This is normally more acceptable in smaller homes, with less space. Plasterboard is commonly used as the panel, but this can be heavy and cumbersome. 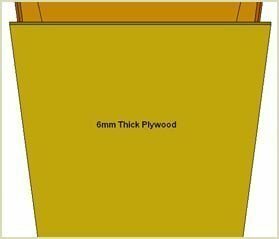 For this example, we shall use 6mm plywood, as this is much easier to use and handle. 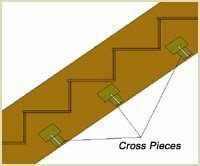 Here at Pear Stairs, we manufacture staircases with a 15x6mm groove cut along the bottom edge of the strings (see diagram below). This is so that a 6mm piece of plywood or MDF can anchor against and sit inside the groove and block off the underside of the staircase. The plywood sheet will be flush with the edge of the strings. 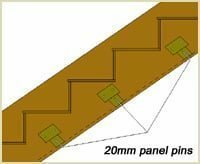 For larger width staircases however, it is recommended to use crosspieces to provide extra anchoring points for the plywood backboard, as the following steps describe. Cut small sections 25x50mm (known as battens) and affix them to the inner edges of the strings. Use adhesive and screws to affix the battens onto the strings. 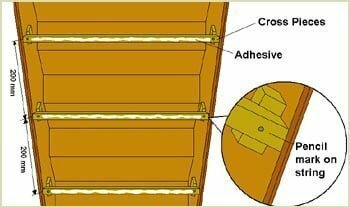 The battens need to be affixed approximately 200mm apart from each other. With the battens in place, it is now time to add the cross pieces. These pieces of timber go across the underside of the staircase and affix to the battens. The cross pieces should be cut from the same type of wood as the battens. They need to be screwed into the battens. Make sure the cross pieces are flush with the edges of the strings as the plywood sheet will need to be affixed to both the cross pieces and the strings. Once the cross pieces are in position, mark with a pencil the centre of each piece along with the edges and the side of the strings. The reason for this will become clear in the next step. 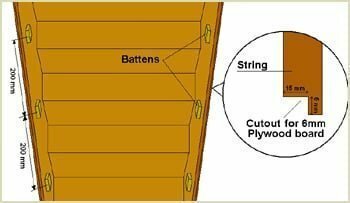 Before affixing the plywood panel, apply some adhesive along the out facing edge of the crosspieces and in the groove along the bottom edge of the strings. With the underside of the staircase measured out, cut the appropriately sized 6mm piece of plywood and affix it to the underside of the staircase so it fits within the groove at the bottom edge of the strings. Apply pressure onto the board and it is advisable to have an extra pair of hands to hold the board whilst you move onto the next stage. 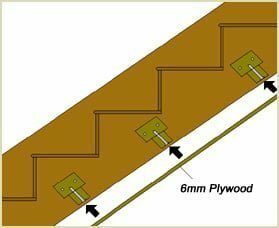 Where you marked the string on the previous step, draw a line in pencil across the plywood board to join the marks together on each side of the strings. 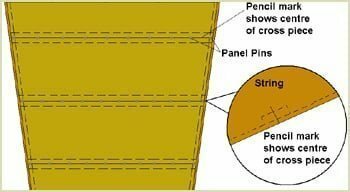 This pencil line marks the centre of the cross pieces and can be used as a guide when nailing in 20mm panel pins into the plywood board (and onto the edges of the strings). Use a nail punch to set the pin heads below the surface of the plywood. Cover the holes with filler and sand over once its dry. Nail on a piece of wood trim to cover the exposed joints between the edge of the plywood and the strings. For the final touch, you can chose from semitransparent, or opaque stains, clear coats, or paint. If you are using MDF, then a primer and paint is recommended.